For all of you who love the Cliffs of Moher, please do not get me wrong as I love them as well but they are not nearly as impressive as Slieve League in Northern Ireland! 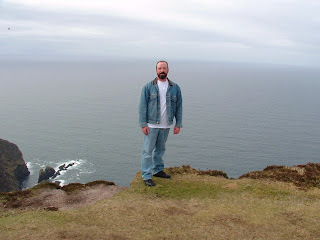 The cliff are not nearly as well known as the Cliffs of Moher and that is part of their attraction. They are not easy to get to either and this leaves a very unspoilt landscape. And the best part of all, a visit to the cliffs will not involve opening your wallet! The cliffs are about 30 miles from Donegal traveling through Dunkineely, Killybegs, Kilcar and to Teelin where you found a narrow, winding, single lane road with hairpin turns and sheer drops. There is no margin for error and no barriers on the seaward side. Until just recently, the road wound around the cliff side with dramatic rises and falls that would leave even the most stalwart explorer breathless. In the past year the road was leveled out but it is still a one lane road that hugs the cliff side and can be a wee bit dangerous if you are not paying attention. I actually preferred the road more before they leveled it out, but it is much safer now, and now our minibus can even make the climb! When you get to the car park at Bunglas Point, you can walk across a green meadow which abruptly stops and you will then be rewarded with a cliff side view that has a sheer drop to the Atlantic Ocean below! You can then look across and see the highest point of the cliffs which rise almost 2000 feet out of the ocean! From the car park there is still so much to see by walking the 1 1/2 miles to the cliff top. As you walk towards the terrifyingly high top of the cliffs, you have spectacular views of the Sligo Mountains and Donegal Bay. A short walk will take you to the right of the cliff face of Bunglas (which literally means, the end of the cliff) which rises over the raging ocean below. There are a number of cairns to see as you travel along the cliff top before you drop down and cross One Mans Pass, which is a narrow ridge that will take you to the summit. The ruins of a church with some early Christian hermitages lie near the pass. Returning from the summit by foot, one will pass the ruin of a watchtower at the end of Carrigan Head. This watchtower was constructed to defend the northwest coast during the early 19th century when there was the threat of Napoleonic attack. Walking on the eastern side of Slieve League there is a magnificent wilderness of rocks, streams and a deep rugged valley to your left. No matter if you just want to take in the view from the car park or have a more adventurous view, the cliffs are awesomely spectacular/ If you are lucky enough to be here at sunset, the rock face is streaked with changing shades of red, amber and ochre and is truly stunning!